It is made from 20,034 tiles in 20 colours, with a nominal size of 3499mm wide x 694mm high (approx 138 x 27 inches). 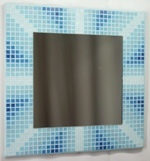 This is a wide mosaic design intended for areas such as a kitchen splashback, a bathroom splashback, a tiled border, a low garden wall or a path. This mosaic design is Copyright © 2011 Kaamar Ltd, based on an original photograph Sunflowers by Bruce Fritz/U.S. Department of Agriculture under Public Domain licence. No of Tiles: 20,034 tiles (318 wide x 63 high) in 20 colours. Mosaic Size: 3499mm x 694mm nominal (approx 138 x 27 inches). Mosaic Area: 2.428 square metres nominal. No of Sheets: 20 full sheets, 13 partial sheets.